This colorful omelet blends vegetables, eggs, bacon, and small amounts of butter and is very simple to put together. It is a great breakfast meal on busy mornings and a tasty upgrade to traditional omelet. This is a savory, quick-to-make breakfast or brunch. The recipe is easy to follow, whether you are a novice or all-around cook. 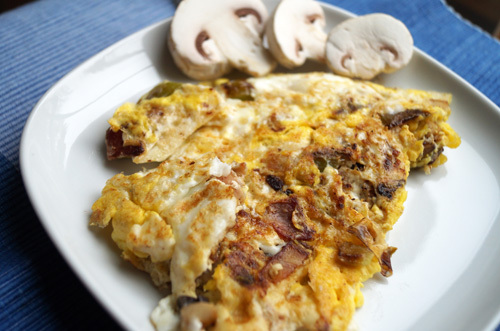 Our mushroom and bacon omelet is a fluffy and flavorful dish with a nice texture. Our friends and everyone at home raves for this tasty omelet so we hope you enjoy it equally! In a large non-stick skillet over medium-high heat melt the butter and cook the bacon, chopped pepper and mushrooms until golden (about 2-3 minutes). Add the eggs, salt and the pepper. When edges of the omelet appear cooked using a spatula flip the eggs over. Use a spatula to slide the omelet onto a plate and serve. Garnish with sliced mushrooms.